Here are some of our favorite WordPress.com features that will help improve your publishing experience. Writing interesting blog posts, creating attractive pages, and interacting with your visitors — these are essential ways to help you build a body of work, a successful business, or a growing audience online. I’m part of a team focused on design and research at WordPress.com — I like to find ways to improve your experience, and to help you reach your website or blogging goals. In this post, I’ve compiled five of our favorite WordPress.com features that streamline your publishing experience and help you make an impact with your work faster. We’ve recently moved things around a bit in the editor. 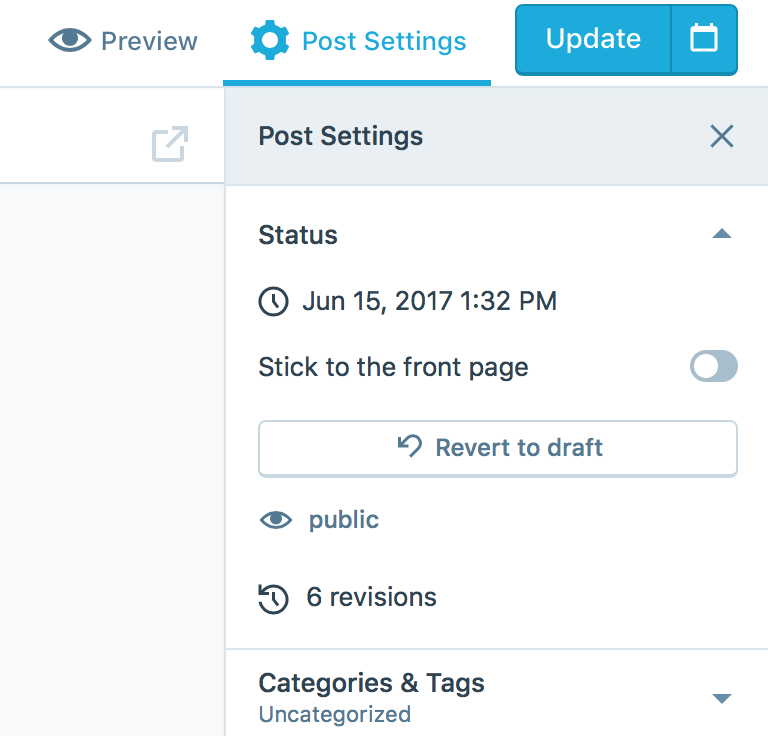 The settings for your post or page are now on the right — and can be hidden! Just click the cogwheel icon above your toolbar. If you yearn for a more minimal experience, hide the post settings so you can focus on your writing. Visuals make posts and pages more compelling. But going through the steps to add image files often takes time and interrupts your flow. Did you know you can add images simply by dragging and dropping? Just drag an image file from your computer into the browser window and drop it in your post. In the screen capture above you might have noticed a smaller, rectangular area on the right where you can drop your featured image. Many themes use featured images as header images or when displaying posts in lists. It’s an important image, if not the most important image, that you can set for your post. On WordPress.com, you can nest pages — a page can have a few “child” pages, and these child pages can have their own child pages, and so on. Many themes then use this information to display different levels of navigation. Super useful! But until recently, it’s been a bit cumbersome to understand this hierarchy when working on your pages, and impossible to see at a glance. But not anymore! At My Site → Pages, we now show the page hierarchy on the pages list (if you have fewer than 100 pages). This makes it much easier to scan your site’s structure and directly find what you’re looking for. You can shorten the slug or even rename it entirely. For example, let’s say you had a page called “Our Restaurant’s Menu” — WordPress will create it at “/our-restaurants-menu.” But now you know: You can make it accessible at the shorter and simpler “/menu.” Ideally, you do this before you hit publish, so that your readers will have the correct URL going forward. For many of you, being able to interact with your site’s visitors is one of the most important aspects of having a website. Did you know you can respond to your comments all in one place? Take a look at your post list at My Site → Blog Posts. If a post has comments, you’ll see a small chat bubble among the icons on the bottom right. Did you know you can reply to comments right from here? Try it out the next time someone comments on one of your posts. And if you get a lot of comments, this is an easy way to streamline conversations and keep in touch with your readers or customers. We work to make WordPress.com a bit better every day, and we hope that these tricks help make blogging, writing, and designing your site easier and faster for you. Do you have a pet peeve — a small thing that you think could be made even faster, simpler, or just better? Let us know in the comments. I’m curious. Is there a way to make your blog public, but block certain people from seeing it? Thanks for the tricks! I was actually wondering how you change the font for the blog posts too! This is awesome! Can’t wait to try them. Nice tips. Small pet peeve: on iPhone. The notifications that reference a comment I’ve made previouly don’t point to my comment. They point to the top of the thread. So for community pool for example, where there are sometimes 100 comments, I have to scroll through to find the relevant comment. Thanks Elby! That’s great feedback. I’ll pass it on! Oh, one more: the caption feature doesn’t work for the main image. At least not on some themes. Is not to be allowed to correct the comments I make on the pages of other users. Unless bothers the user responsible for the page, and depends on your good willingness. This is very bad, and I understand that it is a serious failure of this site, if not the largest one. Sorry to hear that! I for one can edit my comments here just fine … feel free to contact our support team in case there are any questions regarding this. Ha! 😀 Through a nudge from a colleague (thanks, @drw158!) I just realized that that may depend on the role you have for the current site. So it may not be possible at all — that’s useful feedback. Thanks, Carlos! Yes, I can also edit the comments on my own page, but I can not edit them on the pages of other users. The image feature is a huge time saver! Didn’t know you could do that. Thanks! Wonderful! 🙂 Makes me happy to see that we chose a good set of features to talk about. Thanks, it’s alway handy to know the tricks and tips. “Social” media is probably the least social of media available to us. Why? Because people can only leave words they type in a comments box. I wish you would make if possible for them to upload sound, especially their voices speaking the comments. The visually impaired people would certainly appreciate it, but there is another reason. The information in a person’s voice is so much more than the words they type! Having them record their voices and post that file next to the words they type would really help those of us with the wordpress.com. There are at least 2 apps out there that are available online for recording things for people without them having to have a resident software package on their computers/phones, etc for this purpose. Thanks, that’s good feedback! We try to be on the forefront regarding accessibility best practices. But it’s true, there’s something in a person’s voice that gets lost when you write something down. I try to compensate with emojis a bit! 😬 But you might also want to try one of our other services, http://cloudup.com/ — it allows you to files and then link to them. Sending links to voice messages could be a good way to bridge this divide. Don’t forget that there could be people having trouble hearing, too, of course. I’ve been using WordPress for my blog for some time but hadn’t written anything for a while. I’m writing a life history to tell the story of my family and myself and have added pictures at appropriate spots in the blog. I tried the finish a post the other day but got stumped by the new features. I’m not thrilled with the new image insert feature because it’s not as flexible as what I was doing before. I added an image which I wanted as a small side note, but inside got a huge across the page image. I never saw any way to change the size as I used to do all the time. AND I couldn’t figure out how to delete the totally inappropriate image. I would appreciate some help! I did not know about the drag and drop picture trick. That is very helpful! Very helpful! I actually didn’t know about most of these. Nice job! Thanks for working hard to make writing a positive, easy experience! Thanks Miss Dino, interesting feedback — we’ll keep that in mind! You’re welcome, and good to know!! I get very frustrated with the editing of my blog posts!!! I seem to edit over and over only to see it not appear in the final form or it saves constantly and not what I corrected last. I end up spending hours trying to figure out why my saved editing isn’t there. Please advise. I hate that it constantly saves; is there a way we can change how often it saves? Right now that leads you back into the old administration interface, but we’re working on refreshing this one also. Hope that helps! The problem is, I edit but my edits aren’t caught. Because I go back and my new edits aren’t there. It happens over and over. So I was thinking maybe as I edit the timing of “saving” is all off? That doesn’t sound like the intended behavior at all, and you should get a message that warns you about unsaved changes. Please contact our support team to get to the bottom of this issue. Thanks! I love these new additions, especially the new way to streamline conversation. Since I promote my blog through social media, I check my “Referrers” quite often in stats to see what’s working. I would prefer their location at the top, above Countries. In fact Countries is the least interesting to me. I always have to scroll to the bottom of the page. Ha, same for me actually! 😆 Thanks for the feedback! One of the features that has been removed from the new editor is the image “link to” capability (media file, attachment page, custom url, or none). Although this is still available in the original editor, I really wish I didn’t have to swap back to the original editor to change the settings for my images. Many of my images are high-resolution and I want to be able to control what happens when users click on them (go to media file or custom URL). Please consider enabling this feature in the new editor. Also, I perform a lot of analytics on my blog history. I love the ability to download daily data, but it sure would be nice if you enabled a date-range for downloading daily data, rather than having to download one day at a time. Also–I’ve never really understood the difference between categories and tags and how to best use them. Advice? Thanks! So I think I have it. A review on a book could be categorized under “reading” “literature” or “reviews” and tags could be “Sir Conan Doyle” “Sherlock” “Dover Books”? I see categories as being general topics and tags being specific. Would it please be possible for “Parent” categories to be in Bold text and the “Child” sub-categories to be in normal text? This would make large (mostly) travel categories like mine easier to read. Thanks! This is very helpful material. Thanks Leif. I appreciate it. I didn’t know about the comments bubble on a post. That will make managing comments much easier, thanks! One enhancement I would love to see in the future would be the ability to turn off avatars on likes. We can do this on comments for a more aesthetically pleasing post. The tiny like pictures look silly on serious posts. Thanks again for doing a great job with WordPress! Here’s a thing that needs fixing: you’ve changed it so when I have an embedded link in my post and I click it the text, there’s this light blue highlight that pops up over the text…this makes it really hard to change the colour of said text because it’s hard to highlight like one would normally do, and even when I can highlight it, sometimes my colour or underlining or whatever just….doesn’t work? Is anyone else having this issue? Thanks for reporting! That sounds like an issue that needs a bit more diagnosis. Please don’t hesitate to reach out to our support! Hi, on a classic editor, when one aligns the inserted image to the right or left, the image automatically shrinks to the correct size with the flowing text. This is a very convenient feature, which is not available in the new wordpress.com editor. The editor wouldn’t resize on its own, upon flushing right or left. You have to drag to resize. Please see if you can provide the similar feature in the newer editor. I really like the drag and drop feature and especially the comment feature. thank you. Good information here. It would be great if there was a way to organize media files into unique user-defined folders by topic/theme. Really appreciate your info. Thank you for making things easier to use. Very Enlightening! Will try these steps. Thank-you. My big pet peeve sometimes happens when I’m posting a Photo Challenge. I go to copy the link to the Daily Post theme, and the link simply refuses to “paste”. I press Paste and get nothing. That is very frustrating, especially since I love the photo challenges. Thanks! Thanks. These are useful tips. Does the hierarchy mean I can split my blog page into several different child blogs? No, I wouldn’t call it that. This hierarchy is used by many themes to build your site’s menu. You could, however, link to different categories in your menu, thereby creating different pages for people to go to for different topics. Happy to know about these wonderful changes and improvements. Drag and drop trick is very helpful. Thank you! Thanks for the update. 🙂 🙂 I’m a bit of a dinosaur and tend to stick with a tried and tested method when I know it works for me. It sometimes feels as if there is too much tinkering going on, even though I know you’re trying to create a better experience. It’s useful to know of changes, however, and I will try a couple of these out. Yes indeed, thanks for pointing that out. How a featured image is used is the responsibility of the theme. So if your theme doesn’t use them, they won’t be as useful. But they might be in the future, should you switch to a different theme. Thank you for clarifying, understood it now! A picture, gif or emoji compression tool with low quality loss for those who (still) have a free plan would be amazing. My dilemma is that I am trying to make the blog faster, but do not want to give up on gifs and emoticons, because they truly allow me to express my emotions / state of mind. Complicated, I know. Thanks for your valuable tricks about blogging. I am a beginner here. Can you give some advice and faults of my blog? Wonderful, thank you Leif Singer, I really love the drag and drop feature, it really helps out a lot. And the comment thing is the first time I saw it. Good morning and thank you for these tools. And explaining them so clearly to the lay people like me. If you’re in the USA, have a Happy Fouth of July! Thank you so much for sharing. I will have to try these ideas next time I blog. It was very helpful to read. Is there a way to place your images in their own folder in media? This would make life so much easier if I could place the photos/jpgs into their correct folder, then I would know where I wanted to go to get it instead of haviung to scroll through the thousands of photos I have. I use a custom menu to which I often add new pages. I have to add the page to the menu (it gets added to the bottom) and then drag it to where I want it. I wish I could collapse the custom menu, showing only top level pages, before I begin to drag. I would have less distance to drag. I could then drop my new page about where it is going to be placed, expand the custom menu to list all pages and subpages, and place my new pages in its final position in the hierarchy. Thanks for the tips, I am especially grateful for the one about changing slugs, still coming into my own, But I’ve been focused on writing a good amount of material. But I’m hoping to begin designing the site soon, this will be helpful. Super helpful article – thanks! Super helpful text and visuals! Thanks, Leif !! Thanks ! In the Reader, I’d like to be able to share the post I’ve just read on Twitter. I’d also like that posts that I’ve read become “marked as read” and disappear from the screen. I still use the old HTML editor, because I use Markdown and it doesn’t come out right if I use the WYSIWYG editor, and you made the “new” editor so foolproof that I can’t find anything. It works great from my Mac running Sierra (MacOS 10.12), but on my laptop (running Linux Mint 12.04) there is a delay of several seconds between when I type a letter and when the letter actually shows up. This doesn’t happen with the WYSIWYG editor or either of the new ones. In both cases, I’m using Firefox. What’s going on, and how can I fix it? You’re mentioned featured images and I’m curious what’s the best practices in your opinion to confirm with the most common CreativeCommons license? Thank you for the tips & tricks! Definitely they will help to blog better. These new features will be really useful to me. Thanks for explaining how they work. Many of my readers have asked me how to let them like my posts without having a wordpress account. Can you please advise what settings can help me do that? I found these tricks very useful, thanks a lot! I only have 10 Post but I would like to learn more about the pages function for organizing it better. These tips seem like little things but can actually multiply your positive experience on WordPress. Love it. I often visit Community Pool and First Friday to leave comments. One thing that annoys me is that I must go to Page 1 and start scrolling through all however-many pages to find the comments I’ve left and see if people have replied. I get a notice when someone likes what I said, but no notice when they leave a reply. And I don’t want every comment that’s left on every coming into my In Box, so I wish there were a way to go to one of these sites and review only my own activity. As a complete WordPress novice, this was a very useful post! Great article, Leif! As a new blogger, I have much to learn and implement. Thank you for making it easier with clear, actionable, well-written content. Great tips, especially the drag and drop image feature. I blog daily, and never knew about this! Managing images — I need an easier way to rename and organize images by topic or directory, so that they are easier to find. On my iPad Mini, there are interface issues. Most annoying, I have intermittent problems with being unable to easily and accurately select, copy, and paste text while writing and editing my posts. For example, I want to select a phrase to format, delete, or move, but I can only select the entire paragraph. And why can’t I CUT and paste? A related issue is that sometimes when I try to move the cursor, the display jumps to the top of the post, and I have to scroll down again. Would also like to see an easier way to add hotlinks, which can be cumbersome at times. Still having issues with automatic and manual sharing of posts to Facebook. Sometimes the share goes to the top of the blog thread, not the post. The title does not display correctly, or the wrong image is displayed. Or the auto share to Facebook does not work at all. I have contacted WordPress.com support about this, and there was a bug to fix. But even after the updates I’m still noticing problems that come and go. Thank you for this helpful information!! Much appreciated! I am experiencing one technical issue, however. After adding an image, I click on the “edit” tool (the pencil) to crop it. But after I’ve cropped it, there’s no “save” button — only the “back” button — so it doesn’t save my cropped photo — only shows the original one. This has happened repeatedly. Help? Thanks. very useful tricks for using these features , the short videos make it easy to see how they can be used. Looks like these are simple things. But when we start implementation these all will make big changes. Thank you so much. To Leif Singer. Thanks for the tips! I’ve been writing my blog for about a year and I’m still learning how to use WordPress. Didn’t know about the drag and drop into posts feature. Good to learn. I have a pet peeve at the moment. Adding items to go under a Menu is painful. My list of items (posts mostly) will be nearing a hundred soon (I’m running a recipe blog)—dragging an item from the bottom of the list to the top or somewhere in the middle takes ages. If there’s a way to drag sideways (from the selection then straight to anywhere in the menu [structure]) instead of starting from the bottom of the list, that would be really helpful. Thanks, Leif! Since I’m new to WordPress, I appreciate the helpful tips!